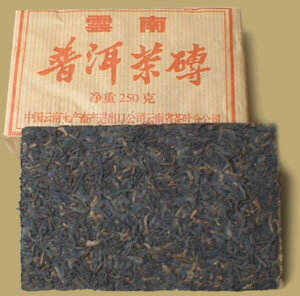 CNNP brick is perhaps best known for 7581 ripe Pu-erh brick, this 2002 vintage one is also excellent. The tea uses middle grade leaves for the brick center and cover the surface with tip leaves, aged by slowly dry aging and storing the tea to create a real nice Pu-erh. The mellow liquor of this Pu-erh is thick and heavy with a sweet and pleasant woody aftertaste. Excellent for drinking now or even better to put away for aging.